How did the podcast start? The original Facebook message that started the podcast. 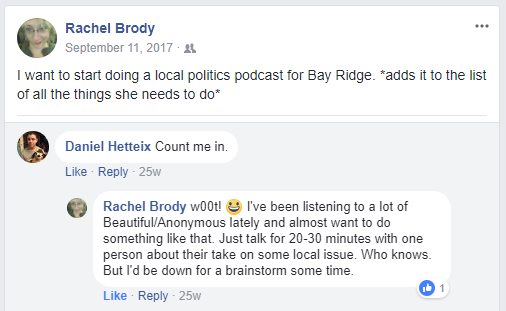 We started Radio Free Bay Ridge on a lark one evening in 2017 when Rachel, a local activist, asked on Facebook if anyone wanted to start a podcast about Bay Ridge. Dan decided sure, why not, and replied. We really didn’t know what we were getting into. After a few meetings over coffee, and a few scrappy early recording sessions with just a laptop mic in a guest bedroom, we’d started our own podcast. Dan and Rachel were soon joined by Dan’s wife Mary and one of our first listeners, Erik Shell, to form a team of burgeoning local political podcasters. Along the way, we also worked with local issue experts, like our transit correspondent Brian Hedden. Our team is constantly changing, so take a look below to learn a bit more about the Radio Free Bay Ridge family… and by the way, feel free to contact us if you want to get involved! This platform is as much for you as it is for us! In addition to his work editing and co-hosting the podcast, Dan ran The Ambrose Light satirical blog, which pokes fun at the ridiculousness of small-town politics in the neighborhood. He often volunteers as a videographer for local events, protests, and political campaigns. His background is in technology, urban planning, architecture, and historic preservation. He spends whatever free time he has avidly reading and researching, obsessing over tea, and playing with the studio’s cat (an adopted stray). His favorite episode so far is our deep-dive into how hyper-local nativism surfaces in political discussions and speech. A former ESL teacher, Mary has volunteered for a variety of activist organizations, including the Khader El-Yateem Campaign, Fight Back Bay Ridge, South Brooklyn Progressive Resistance, and Bay Ridge for Social Justice. She can often be found working on crafts, writing historical fiction, and getting drunk with socialists. Her favorite episode so far is the round-table analysis of our last City Council election. Erik is an independent voter and formerly-closet progressive from Nowhere, Ohio. He works at a non-profit that promotes the learning of Ancient Greek and Latin, and is slowly trying to move into the education policy field. He enjoys playing D&D, hiking, and talking to strangers. His favorite episode is our analysis on how a new school can be built in the neighborhood to alleviate overcrowding. Brian is a co-founder of local cycling advocacy group Bike South Brooklyn. He’s not a community board member, he just plays one from his armchair. Netflix has extensive data on how long it takes for him to fall asleep. Radio Free Bay Ridge is an all-volunteer podcast, and we refuse advertisers in order to maintain a flexible, accountable podcast that can center progressive voices. We’re always happy to get in touch with you if you want to know more about the podcast, and you can generally find us in-person at any of the numerous progressive events and organizations in Bay Ridge.